Much has been made of the so-called “sharing economy”, but few of the businesses in this sector actually fulfil the sharing part of that phrase. Uber, for example, has nothing to do with sharing – but a new UK-based app offering car borrowing and insurance by the hour actually makes good on the terminology. Car sharing is not a new idea – Zipcar has been well established in London and elsewhere for a few years – but what Cuvva is offering is not a dedicated car sharing service, but a way for people to rent their friends’ cars and gain insurance on the vehicle by the hour. The Barclays Accelerator-backed app started by letting anyone get car insurance by the hour with just a few taps of the screen on their iPhone (an Android app is coming soon), which meant that you could share the driving with a friend on long journeys for as little as a fiver. That idea was enough for our sister music blog The Blue Walrus to have Cuvva as the sponsors of their Glastonbury festival guide this year – with the idea that festival-goers could share the drive to and from the fields – making the trip quicker with less need for breaks, and a little more fair on the driver. 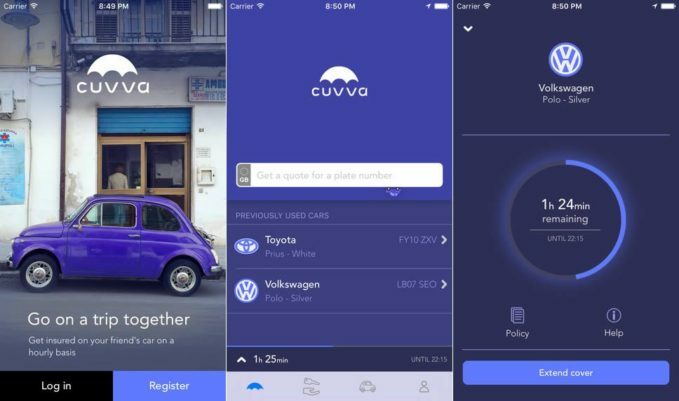 Version 2.0 of the app takes the whole monetisation of sharing one step further by letting people rent their friends’ cars by the hour – in what Cuvva are calling the “Social Garage”. Opening up the app lets users see which of their Facebook friends has a car available to borrow, and how much that rental would be. The costs are generally much lower than with a rental car, and if you are Facebook friends with your neighbours then these cars may well be already parked on your street – and then the app still has insurance covered as well. Those with cars can also use the app to make a bit of extra money towards the costs of maintenance and road tax, meaning that having a car could start paying for itself. If you live in a city then you may not need a car, but for those occasions when you do, Cuvva means that you could always have a car available to you where you only need to pay by the hour. For a limited time-only we’ve managed to convince the people at Cuvva to give anyone that signs up with the promo code TECHFRUIT1, which may be enough for you to get insured on a car for an hour or more.